This same type of quilt is exactly what brought me to quilting 12 years ago. Simple, modern looking patchwork like this will always be my first love. I wrote a tutorial for these type of “Stack and Whack” blocks way back when…so this is an update to that tutorial with some variations for you to try. 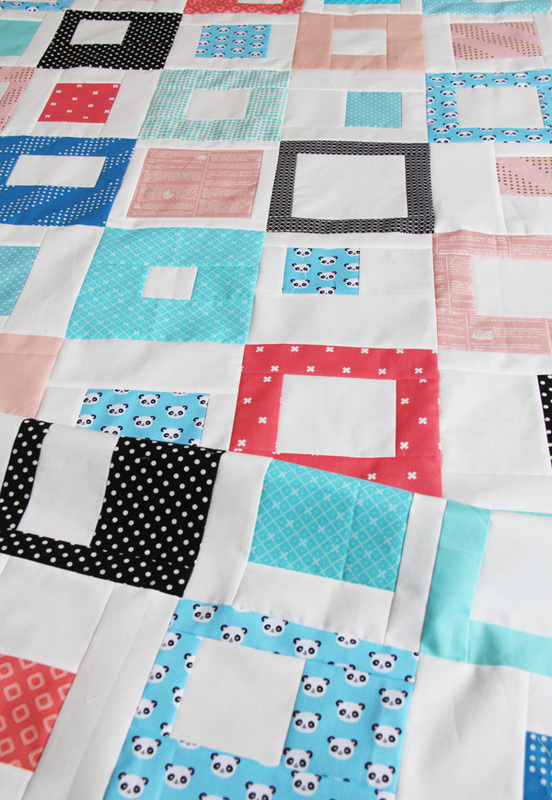 There are pros and cons to this type of block construction, but overall this is a great method for beginners, or if you want to make an easy quilt without having to think too much. Which is me…always. It’s also a perfect way to dip your toes into improv piecing. Layout 2 of the squares to make two blocks. I used a white and a print square, but you can use two prints or any combination. Place them on top of each other right sides up, matching up all of the edges. Cut a horizontal straight line along the top, in my example I cut 2″ down from the top edge. Repeat on the bottom edge, again my example I cut 2″ up from the bottom edge. Cut a vertical line on the center portion, in from the right edge, and repeat with the left. I cut 2″ in from the right edge, and 2″ in from the left edge. This will create a square, or rectangle in the center depending on how wide or narrow you cut your edge strips. Layout the pieces from the two cut squares as shown. Sew the side pieces to the new center square, right sides together, press seams out. Sew the top and bottom pieces to the center units, right sides together, press seams out. Don’t worry about the overhang, or matching up the edges, you’ll trim that next. Align the block on the cutting mat, and trim off the excess top/bottom strips to straighten the sides. The two blocks will measure 1″ smaller than your starting squares (mine are 7 1/2″). My favorite part about making blocks using this method, is that they are easily changed and customizable without doing any tricky math. Below are some examples of different blocks made with the same 8 1/2″ squares by cutting the strips different sizes. 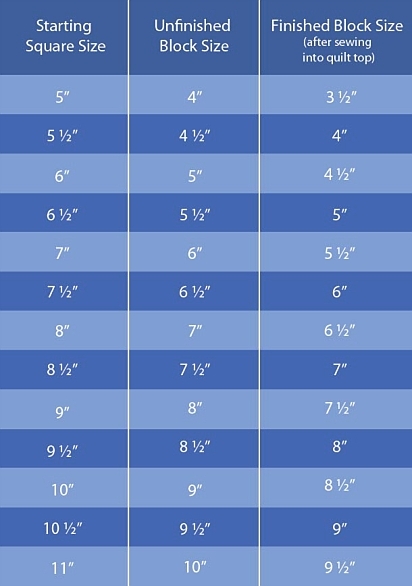 You can use these as a guide and make up your own…you don’t need any specific measurements, just eyeball how wide or narrow you want your strips and cut. You can’t mess these up…so have fun playing with them! Top, bottom, and sides strips are all cut 1 1/4″ in from the edges. Top strip is 1 1/4″, bottom strip is 3 1/2″. The right edge strip is 1 1/4″, and the left side is 3 1/2″. Top, bottom, and sides strips are all cut 3″ in from the edges. Top is 2″, bottom is 1 1/2″. Right side is 4″, left side is 1 1/2″. If you are making a lot of blocks, you can stack and cut four squares at a time, and make four blocks at a time to speed things up. I kept a stack of my 8 1/2″ square on my cutting mat, and when I had a free 10 minutes or so I’d go cut 4 more squares and quickly sew up 4 blocks. Layout the squares and rotate blocks to avoid adjacent seams if there are any, then sew the blocks into rows, and sew the rows together to make the quilt top. Keep in mind that for my quilt, I used half white squares and half print squares. So for example the Crib size requires 48 squares, so I cut 24 print 8 1/2″ squares, and 24 white 8 1/2″ squares. You don’t have to use white…you can do this with all prints or any background fabric as long as you start with the required number of squares. 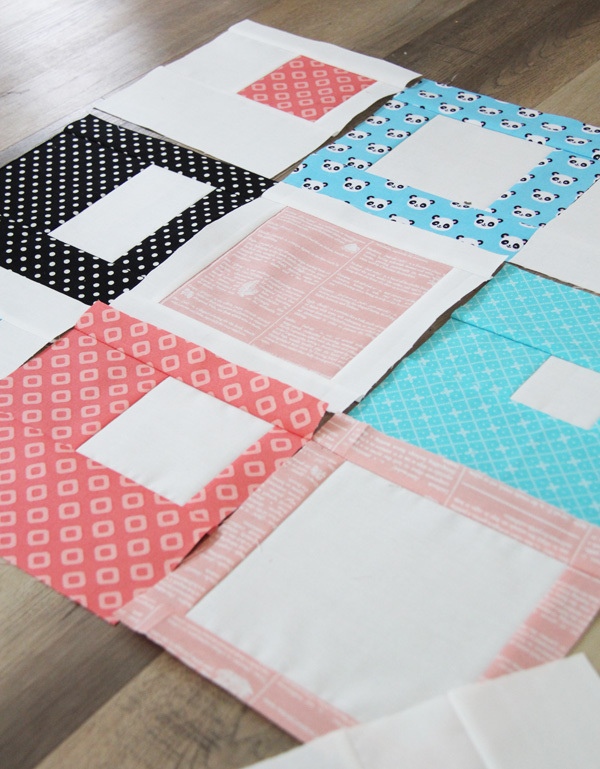 Remember that you can get 4 – 8 1/2″ squares from each fat quarter or 1/4 yard (maybe even 5 squares if your yardage is wide enough). 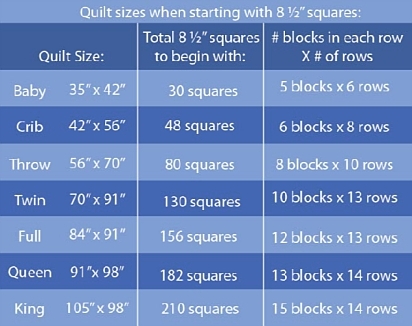 You can get 16 squares out of a yard of fabric, maybe even 20 squares if your yardage is wider than 42 1/2″. If you’ve never made a quilt this way I highly recommend doing it at least once, and if you know someone who wants to learn how to quilt, this is a great method to start them off with. Happy stacking, cutting, and sewing! I enjoy your quilt tutorials. I am a beginner and you have such helpful hints! Can’t wait to try this one. You thought of everything in this tutorial! Thanks. This is very appealing and you make it easy. Thank – you so much ! Thanks for the tutorial Allison! I love your style and always love your posts! This is definitely a fun, quick quilt that I’ve added to my to do list!! 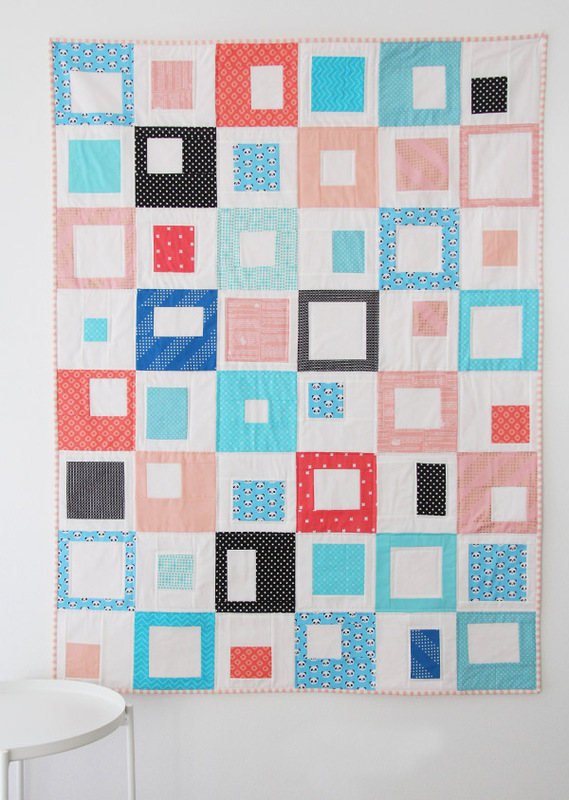 This is such a cute quilt and love the way you put it together. Thanks for an awesome tutorial! Great tutorial! Can’t wait to try it. Thanks so much for posting! Great quilt! I have some flannel fat quarters in my stash and I was looking for a pattern that had both bigger pieces to show off the fabrics and less seams so that I don’t build up bulk. This could easily be the pattern I’m looking for! Thanks for sharing with us and have a great weekend!! This would be fabulous in flannel!!!! Thank you, this looks like fun to sew! This is so fun and I can’t believe I have not made a quilt like this before!! I am bookmarking it to make one with my daughter just as soon as she finishes up the patchwork quilt she is working on. I think she will really like this ;) And I have so many layer cakes, prints and white solids, so this will be perfect for those!!! This is a perfect one for sewing with your daughter! Allison thank so much for this tutorial. I just love this quilt and your quick posting of the tute. Blessings sweetie. I’ve never quilted before and I’m wanting to learn really bad because I’d love to make my girls and my mom and myself a quilt. This is a PERFECT place to start learning! You can’t go wrong with this type of block…just be patient with yourself and make some test blocks! You can do it! this looks so super dee dooper adorable. I am gonna make one right away!! Very creative and simple. Thanks for sharing. I think this would look great with some sashiko fat quarters and vintage linens that have been passed down to me. Thank you! That would look great in this! This type of quilt looks good in everything…you can’t go wrong! I absolutely love this idea. What a wonderful tutorial. Thank you. Thanks Allison, this looks like a fun quilt to make, and would be so fun with a buddy/sister/daughter! Great quilt and tutorial, thanks so much for this. Thanks for the fabulous tutorial! I can’t wait to try it! Thanks, a fun quilt to do with my teenage granddaughter who has recently gotten the quilting bug! This is a perfect one for her! Quick and easy and modern looking! You are a genius! Thank you ‘Sew’ much for sharing! I just love this tutorial. I have made a couple already and plan to do more very scrappy ones. I’m so glad you’ve liked it!! This looks like fun…. 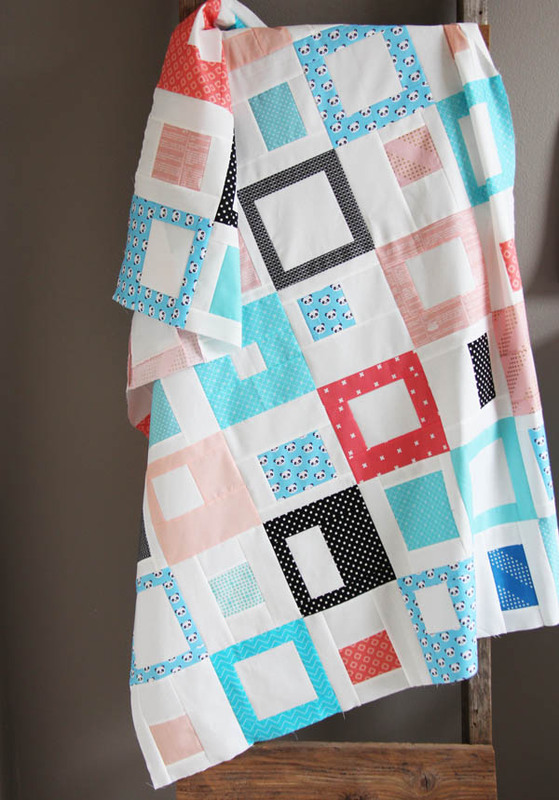 I am not a big fan of white BUT I like the look of the white and prints in your quilt pattern. I am looking forward to trying this with seasonal prints…. looks fun. Thank you! Looks like a fun quilt! Is there a way to make it printer friendly? Great tutorial – sharing on our Pinterest page! Wonderful tutorial for a beginner like me. Thanks a lot. Thank you for this tutorial. I’ve been wanting to make a quilt from my son’s old shirts. Cutting this way, the striped and print shirt blocks will line up nicely. May have to add a few of DH’s solid shirts for more contrast. And I love the idea for a flannel quilt! I have lots of odds and ends of flannel. This will be fun!